Recycled pages are music to my heart! Find a DIY Project to give old books a new life! Are you here to find ways to re-purpose or recycle books ? Good! I hope I can provide you with some crafty do-it-your-self ideas to save your beloved (or not) old broken books. Make sure that you really want to re-purpose this book by reading this page: Deciding if your book can be saved. (will open a new page). It is NOT my goal to have readable books torn apart to create a craft. 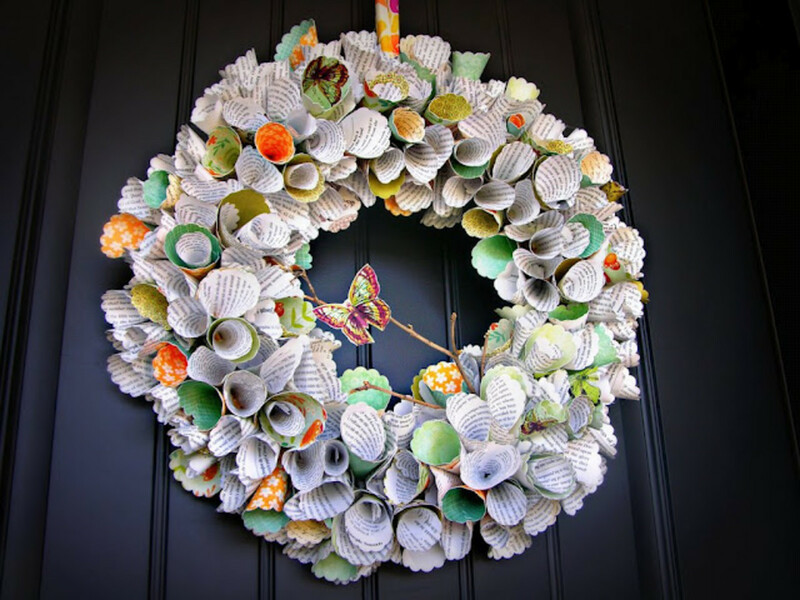 Recycle a Phone Book into a Wreath! 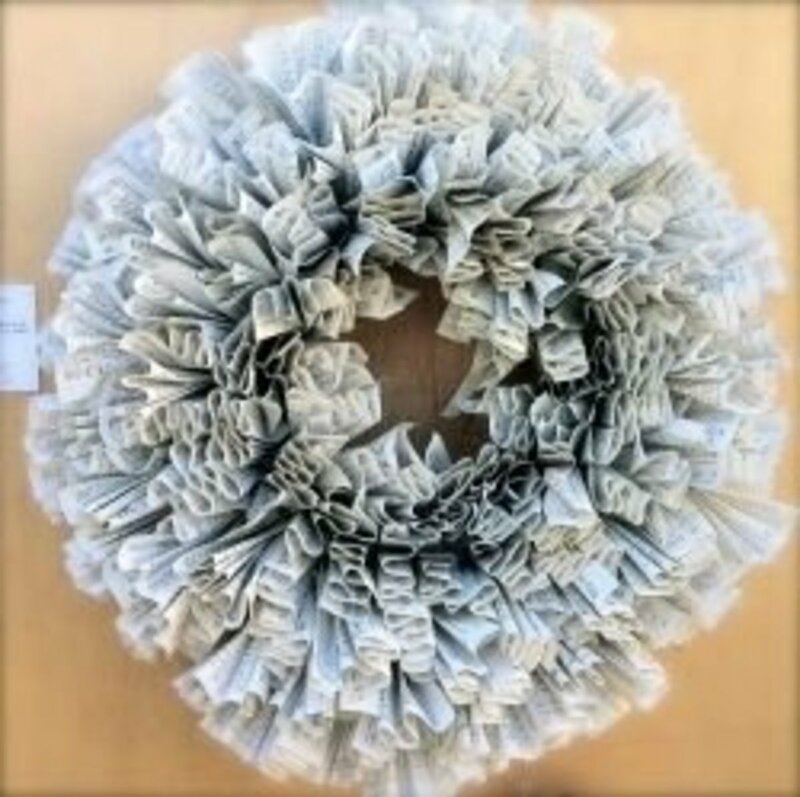 This is not the same wreath that is seen in the introduction, but you can easily make this one by upcycling a phone book. The principle could probably used with any large paperback book that is no longer useful to you. Books About Repurposing Books: - Learn to Remake, Restyle, Recycle, Renew! The first book below is full of ideas for repurposing books. The other one is about how to make books using recycled items. Be sure to notice the reviews of these interesting books on upcycling! You can buy them now on Amazon.com. This book is so popular, I cannot ever get it at the library without a reserve being placed on it. 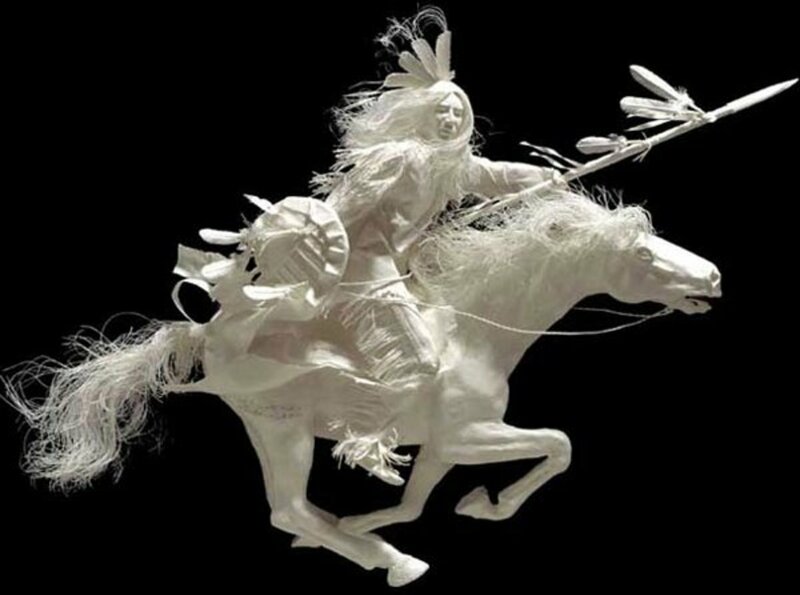 Terry Taylor is a wonderful artist whose work I really admire. This book did not disappoint! Who would have thought you could make such a wonderful small book with covers from an egg carton? Save a book and money! Re-purpose a useless book and make a darlin' book bag purse! The link to the instructions here are offered to the home crafter and should be used for personal use only--not for resale. 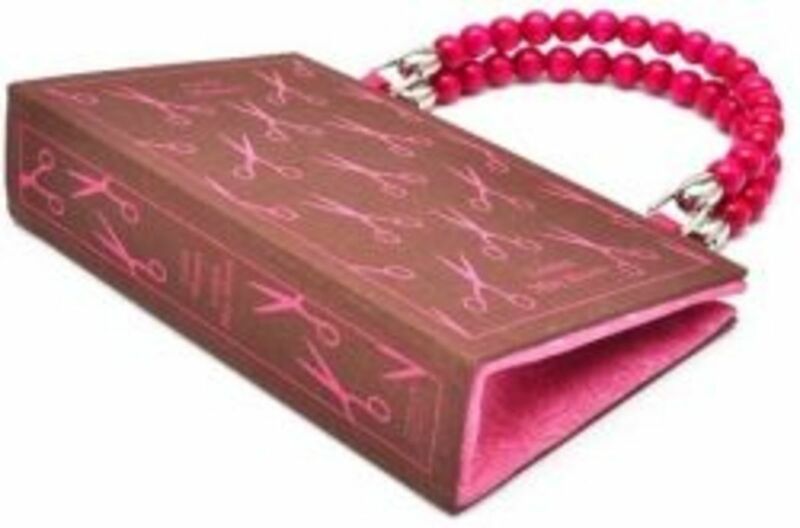 If you would like to do make your own book purse, visit Book Purse Tutorial (with pictures). I have seen some really beautiful purses made from the covers of old books. Use your imagination and go wild. Make sure, I know I am repeating myself, that the book is not valuable! Image of the book purse is used with permission from rebounddesigns at etsy.com artist Caitlin Phillips. She creates professional quality purses and states: "Great care is taken to find books that are unwanted, obsolete, or damaged." Ms. Phillips told me that hers are the original book purses; I am honored to have received permission to use her image as inspiration for amateur crafters like myself. Fold Books to make a Lamp base! Unfortunately, the instructions for how to make the lamp shown here is no longer "live"! However, if you click DIY Lamp Projects, you will find other ideas for "Light Reading" lamps. The original idea for the Literary Lamp was found on "ReadyMade". There are so very many ways to up-cycle books. I hope you enjoy this enlightening one! ReadyMade.com also gave me permission to use the image of this "Literary Lamp" shown here. 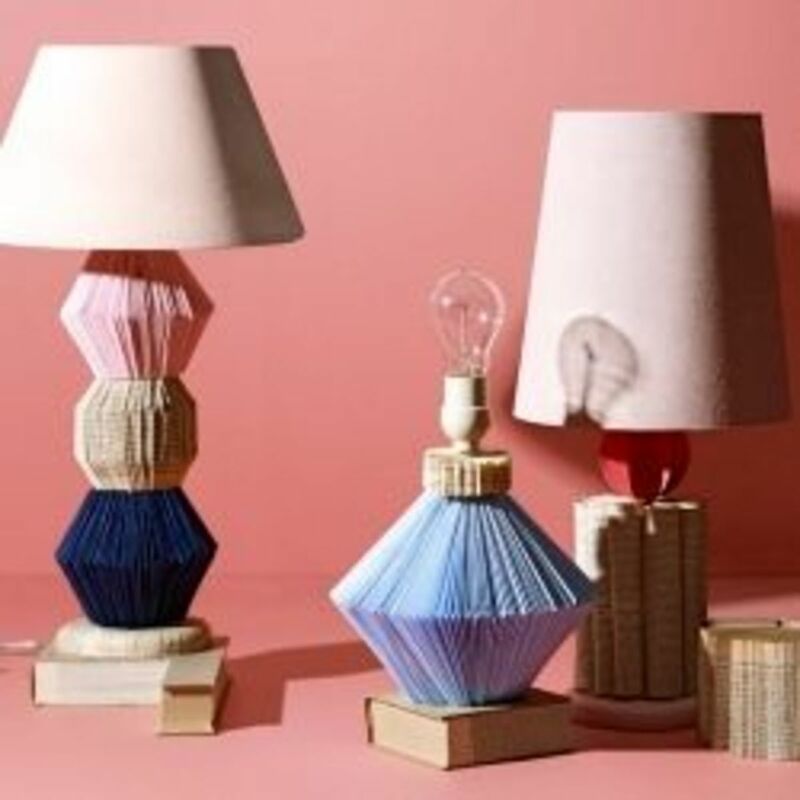 Another interesting article for making a Stacked Book Table Lamp can be found at HGTV's website. The tutorial seems very easy to follow. There is another interesting article where you can find instructions for making a vase or lamp base from used books; just click Book Vases by Laura Cahill on Dezeen. this designer used a jigsaw to upcycle used books into classic curves. Make a Lovebird Book House~ - a book upcycled into home décor! Love a book so much that you will not let it go? Then make a "Love"-bird House. Below you will find a few links about how to do this oh so crafty project with an old book. 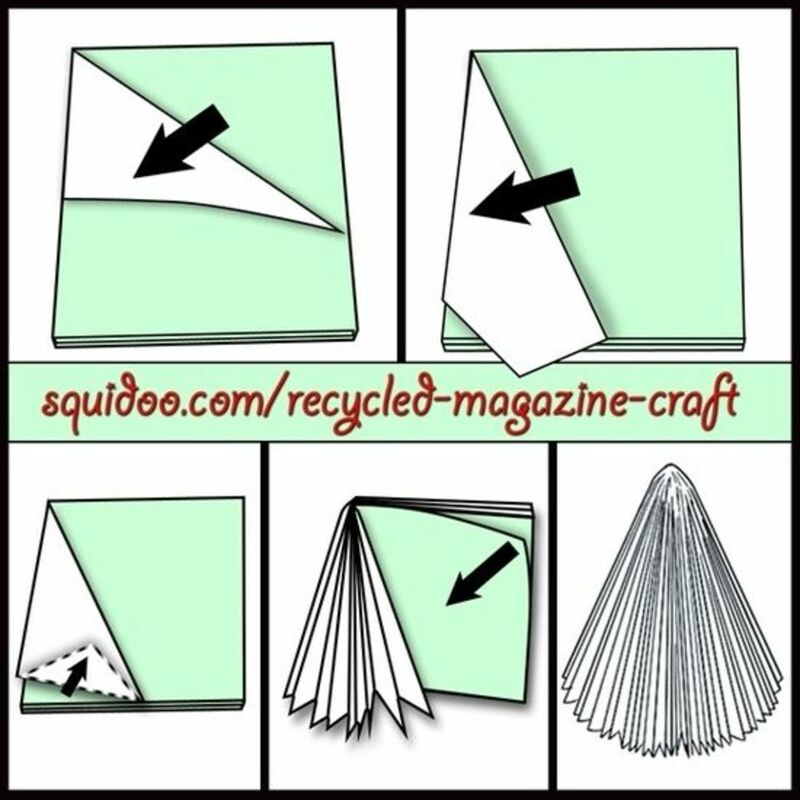 One page is written by a Squidoo crafty lensmaster, the other is from a blog that just might give you some very good ideas about how to upcycle and recycle! The image below is used with permission from Create Studio. Thank you so very much. Lovebird Book House Tutorial from "Create Studio". Create Studio is a fabulous blog that will inspire you in so many ways. Do go and check it out. Thanks, again Sarah Tucker, for allowing me to use your image (above) of the Lovebird Bookhouse. Bird and Birdhouse Crafts has a bird bookhouse as an introductory photo. Novel ideas for using books in your home decor! Find great ideas on this blog: Recycle Books Into Furniture. You can find ideas to make a bookshelf or a table out of old books on this page. Is your imagination getting sparked yet? Don't know what to do with that set of outdated encyclopedias! Click A use for old encylopedias! Even charitable organizations will not let you donate old encyclopedias any more! 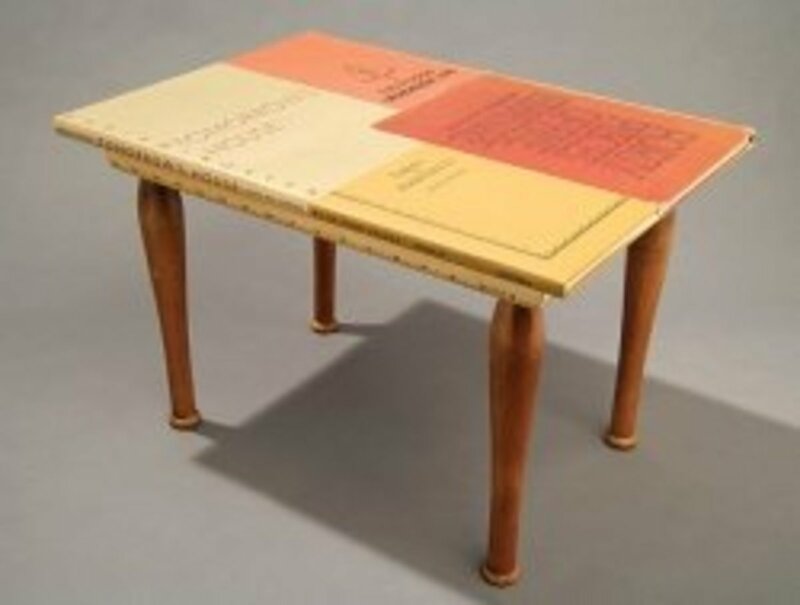 Make Tables Out of Books! Click Tables Made Out of Books to find inspiration. I found a few of the the above websites on THIS resourceful blog entry, Frugral Furniture Made from Books. This Into That is an online store where an artist (Jim Rosenau) explains how his upcycling, repurposing craft is born: "The journey to market begins here, in our carefully tended orchards. Here, a fully ripened book is harvested from the Tree of Knowledge." (That is his "Reader's Table" pictured up and to right. He gave me permission to use his image.). Again, these are given here for your personal use, not to re-sell. Total Time: More than 30 minutes. Old Books that are not valuable to anyone anywhere! Click on any of the websites listed above for making a hollow book. Decide which one you like the best and follow the instructions. Need to refresh your holiday decorations? I am positive that you will find a green (combined with red?) recycling project that your can use to bring cheer to your holiday season. I am constantly amazed by the creativity of the human race! Make sure you check out how to make an angel from an old hymnal! It would take a lot of time, but the results could be spectacular! Below you will also find links and a few images that will give you ideas to make Christmas trees, wreaths, and pumpkins--all using old books or magazines. Imagine the possibilities! 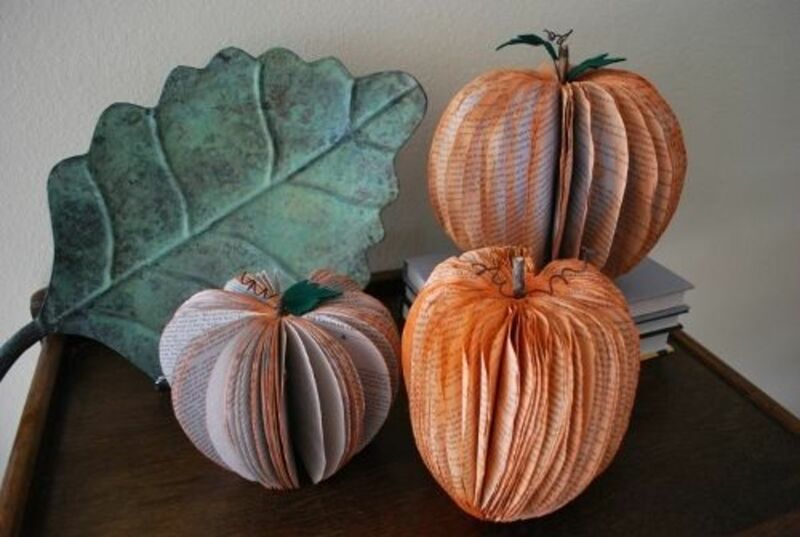 Excellent tutorial for making a pumpkin from a paperback book. A restyled book that is perfect for Autumn and Halloween! Another version of a repurposed book being used as an angel. Mickie_G's "Upcycle recycle" board on Pinterest where you will find more recycling ideas! This autumn pumpkin display might be an easy one to make if you have the old paperback books, an "exacto" knife, paint and some glue and a few other items. Visit Crafting Mom to find out what else you need to make these cute pumpkins. Excellent tutorial with good images for this "how to". Thanks to Crafting Mom for giving me permission to use this image. An excellent way to use of old magazines to make your home festive at Christmas Time. Thanks to lens master,"ideadesigns" for giving me permission to use this image. Unfortunately, I do not know how to find "ideadesigns" on the web any longer. Squidoo is now gone. 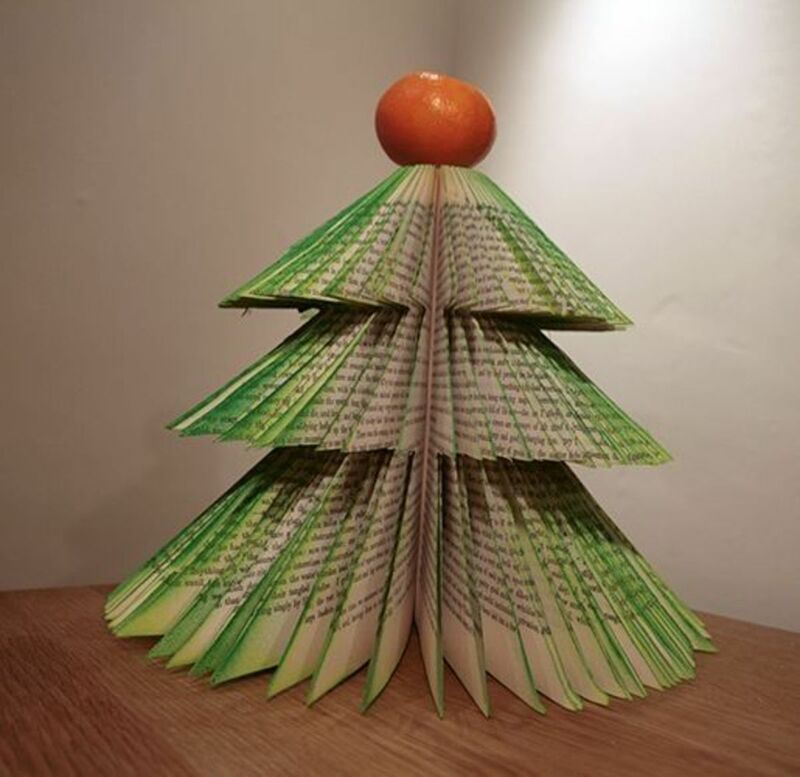 A Crafty Christmas Tree made from a hardback book! Thanks to Littleredbox for allowing me to use the image. If you want to see how to make this tree, just click through to Intsructables.com here: Hardback Book Christmas Tree. You will find all the steps to make this festive decoration. What drew me to this project was the red ball on the top of the tree. I also love the way the color fades to the inside of this upcycled Christmas Tree. 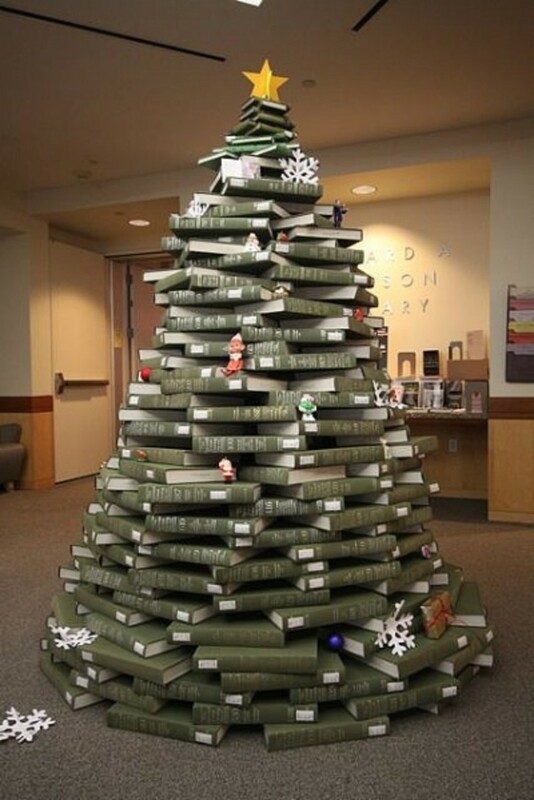 Stacked Christmas Tree in UNC Library--made with books, naturally! Below you will find two books that will also give you inspiration for up cycling old books. The first book is for young adults and children. The second one is for grown-ups, but a creative child will enjoy the ideas and images. What do you think about the future of the real paper book? Will books end up being repurposed, restyled, recycled or renewed? What project might you attempt? I am sure that we will find some way to turn a Kindle or Nook into an object of art one day, too. Put your answer in the Guestbook or comments section below. 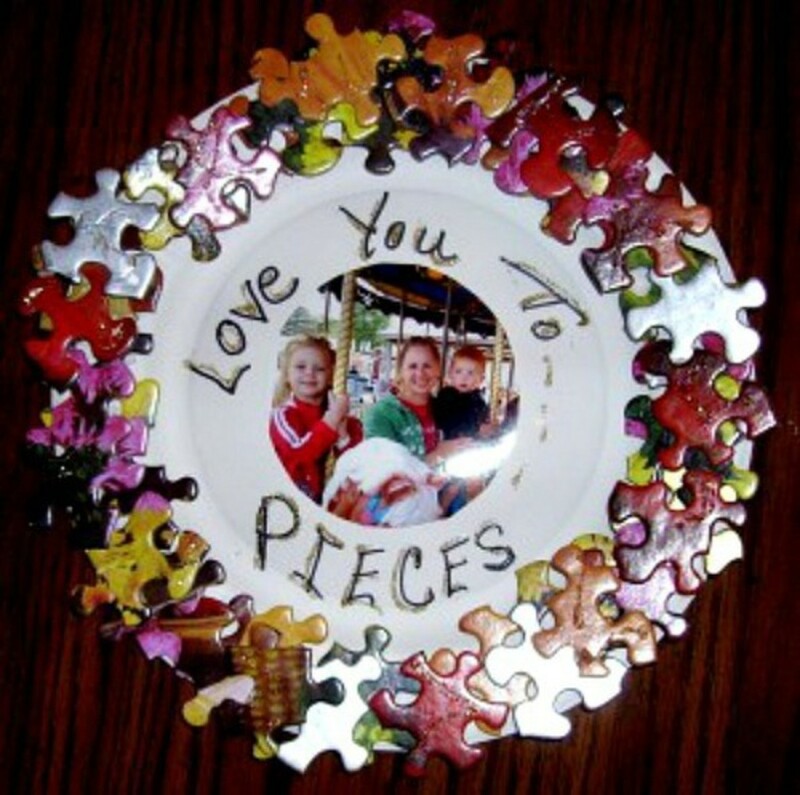 Guestbook: Will you be repurposing a book soon? - Tip: most paperback books are not made to last forever! Came across your lens while looking for wedding shower ideas for my sister. Great ideas you have here. Thanks for sharing them! I love books! AND I love recycling, up cycling, &amp; repurposing! Fabulous lens, because anything that promotes recycling, in my opinion, is absolutely the bees knees! 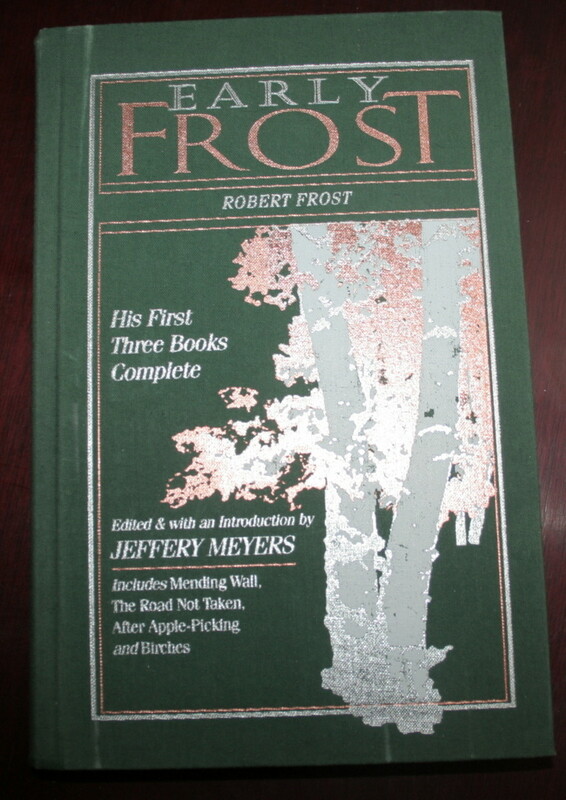 @PAINTDRIPS: I use some of my books to "harvest" parts from for making repairs. I know how difficult it is to get rid of books that one has loved for so many years. I'm in the process of eliminating my excess books (I hate calling them that since I love them all but no longer have room for them). Some I sell, used, on Amazon and others I give away to thrift stores. This recycling page is bookmarked for future reference because I love many of the ideas here. Thanks. What a really cool lens! So many unique ideas, I will definitely be trying some of them out - my favorites are "How to make a Hollow Book " and "Books Recycled into Furniture". Really amazingly creative, love this page, never heard of this idea before. Very clever! It must have taken some time and patience to stack that Christmas tree. Great ideas. Especially liked the purse. The screen might crack some time. You could use it as a picture frame. @anonymous: I especially love books that find a new life when they are either rediscovered by someone who wants to read it or repurposed into something beautiful. Do you have a list of people that make books into furniture as a trade? So light, bright and full of content! Great ideas for what to do with old books I don't sell. Great info and lens. @anonymous: I really do not think that books will ever go away. I hope humans take care of the ones they already have, too. I hate to think that books will disappear forever. Mind you, that's always been a prediction and it hasn't happened yet, so maybe it never will. I love the idea of making books into furniture! I used old books as sketchbook for my art. 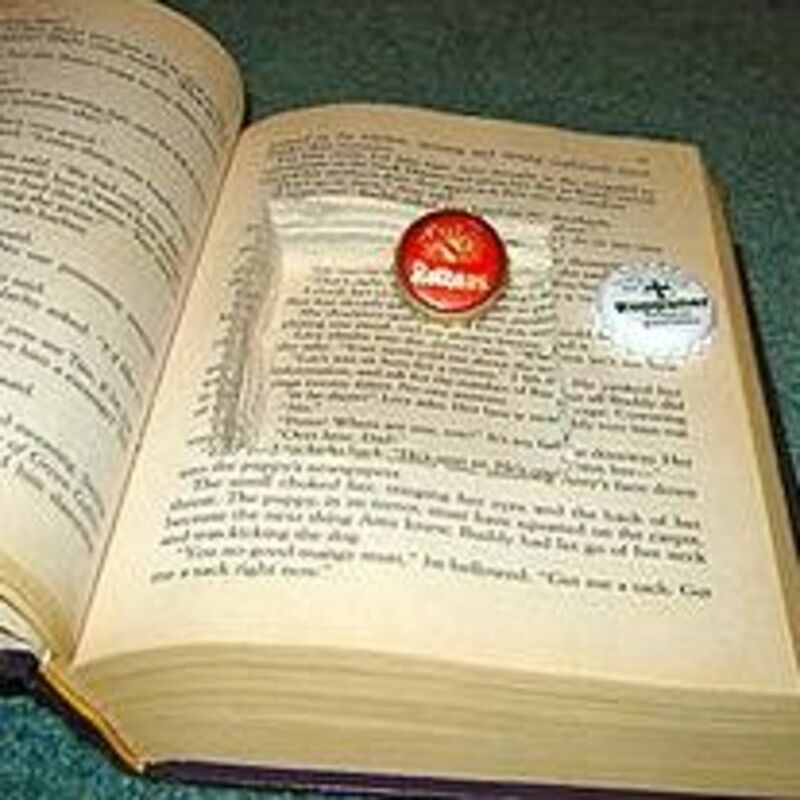 You have found some other great uses for books. @madoc: So far, the only book I have repurposed is an old dictionary that was falling apart. I used the pages to decorate the lampshade. I have a pictured it above. I only have books I cherish as books. Maybe one day. Well, beyond imagination. You have the cutest idea to handle old books. I think I will! What a beautiful and informative lens. very nice uses for old books. thanks for the ideas! Really fun ideas! I'm going to give that lamp a closer look. A lot of fun ideas! I don't think that I can repurpose any of my books just yet. Super interesting! I am a repurposer (is that a word?) but have hesistated with using books. The value of a book has always be instilled in me but next time I come across a ratty tatter book-it is so becoming one of your suggested projects! Thanks for the great ideas. I especially like the purse. I have also seen some fantastic birdhouses fashioned from old books (they're really more like works of art vs functional). Great lens! Well done, squidlikes! I just bought 100 old leather bound law books. Got some great ideas, thanks. Oh, gosh! These ideas are awesome.. thanks for al the info! Yep.. i will try out a couple of these ideas on old telephone directories! I have given away most of my books and now have my new collection in my Kindle. You have given me many ideas in your lens. These are some wonderful, imaginative ways to repurpose damaged books that aren't valuable and give them a new life! Thank you so much for sharing and congratulations on the well-deserved purple star award! Hi I love these great ideals .the trees are great.Thanks for sharing. I like this lens a lot (so do other people obviously looking at all of your likes etc). Even the simple Christmas tree stack looks really cool. Thanks for sharing on this lens. The Christmas trees are pretty cool! Thanks for this lens! Wonderful ideas here....i have so many old books here, that I've no idea what to do with them. These are some great suggestions. the book purse is too cool! Some great suggestions here! I especially like the idea of converting books into furniture. Kindles would look great set in blocks of concrete and used as foundations for multi-storey car parks. fantastic suggestions for old books! :) I still have some books from college that no one wants, maybe I will make some art. I think paper books will eventually become a thing of the past, but I do love curling up with one. I have a Nook and didn't think I would like it, but I love it as well. Awesome lens. But I have no books to repurpose at the moment. I love the angel idea. Very cute. Very impressive. I am having trouble deciding as to if I like the trees made from books or a purse more (saw one at the fair). As I mentioned before, some take time, but if you have made one of these, one should be proud! A friend of mine makes books into postcard albums. The books have to be the right size to take two per page with some room to spare. She carefully cuts slits in the paper to make it like an old fashioned album. the great thing is, she can fit any size or shape card into it because she is cutting the slits herself. Love it! One of the best lenses ever. Some creative ideas. Shall see what I can do with my old books. You've found some really creative ideas here. My wife does a lot of altered book art, and I've always been fascinated by it. Great lens! omg i didn't know you can make such amazing things out of old books ... (for sure only the worthless) .. amazing lense! I would like to do this in the future. I have many books that I was thinking to give away. Now I see that there are different ways to reuse them. awesome lens! I really like it, it's an amazing idea, having this decoration made of books. I really can't imagine how do you came up with this idea. I will really try this one. But as piece of advice, I hope you don't use books that are still capable of giving knowledge and ideas. Wow I really like this lens! I'm a book lover and there are some great tips on what to do with old books. Great job and thanks for sharing! I may do so now that I've been given some truly wonderful ideas on your exceptional Lens. Kudos! I love your lens!!! and I love to read! 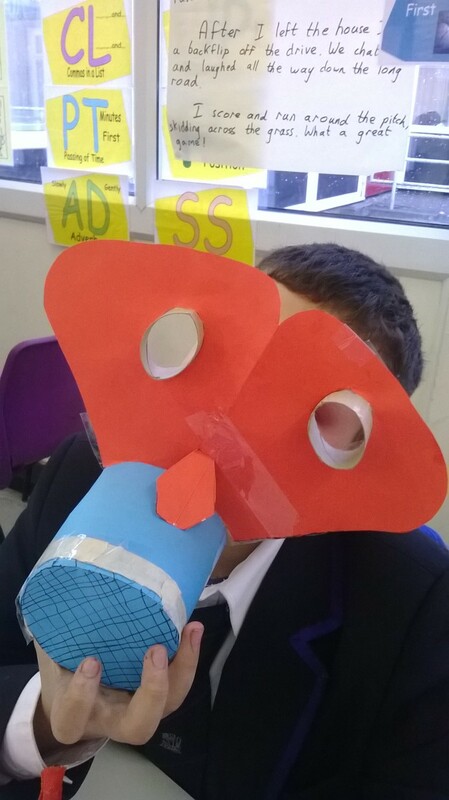 Lots of clever and unique ideas. Thanks for the helpful info. Blessed by a joyful angel. Is giving a book to a friend after you've enjoyed and having them enjoy it too not the done thing any more? I like the idea of someone else enjoying what I've read and talking about it after, rather than shredding them and turning them into a novelty flower or a bag or something. There are a lot of great ideas here. It's quite nice what you can do with old books such as making them into a purse or those cute lamps. Wow! Who knew there were so many ways to use old books. I really hate to throw away books and this Lens has helped me realize the potential in all of those pages. Wonderful ideas! I would have never thought that old books would have been used in so many crafts. Thanks for sharing. Great job! Really great ideas here. I was in a restaurant yesterday that had amazing artwork on the walls, the background layer of the framed artwork was pages from books, and the them then was painted onto the pages. Beautiful. I love to upcycle. I like having books still! Read your lens a few days back and am inspired by the many inspiring ideas shared here. A BIG "High Five"
How interesting. I never would have thought of using books this way. Great ways to recycle. I'm going to keep my eyes open for some old books just so I can do some of these! "High Five" I love books and hate the idea of throwing any away. So I love all the ideas for recycling them in your lens. I love all your ideas but I would have to have a book with no purpose to do any one of these ideas. I love all my books and I revisit them often. I remember doing some of your art projects shown above! They brought back great memories! Thanks for a wonderful lens! Great lens, enjoyed it. Yes it makes you wonder what is the future of books. I don't know if I will, but I am tempted. We were just at an antique mall yesterday and I saw a wreath made out of beautiful yellowed pages of an old book....it make my think of this lens! Angel blessed today! Back to pin this great lens. Ecological and pretty. My favorite local book store closed, they just weren't busy enough and I miss them, it's happening to more and more of even the larger book stores. I would love to make the purse book, bookmarked! So many great ideas here, love them all. I'd like to link this to my How to Celebrate Earth Day if you give the ok to do so. Congratulations on being on the front page of Squidoo. Simply a stunning, highly original, and refreshing site. I enjoyed the many visual references as well. I'm going to link somehow to this lens on my Elaborate Gift List for Writers and Poets lens. Beautiful, terrific job!!!!!!!!!!!!!!!!!!!! Did I mention I was impressed to the hilt? Oh yeah, I think I did. I'll shut up now. great lens about recycling things such as books. I will apply some of your tips and thanks for sharing wonderful lens.. I absolutely LOVE books... and I love that tree made out of books :) Blessed! I love these ideas! I'm planning my wedding, and since I'm an editor and my fiancé is a musician, most of the décor is made from old dictionary paper and sheet music. Your lens gave me a few ideas for some finishing touches -- thanks! blessed! Going to try that wreath one of these days with some old books I have laying around the house. What a nice idea for a lens, thanks! I am very fond of old books. I collect and donate a lot of books to our local library but do come across some that are so damaged they are not saveable...and next time I come across one, I want to try the "lamp base" project. I have the perfect spot picked out already. Wonderful lens. Blessed.